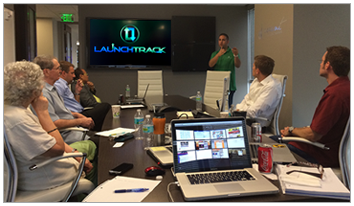 The LaunchTrack team of event-industry professionals has produced over 250 national events. From concerts for artists like Maroon 5 to the NCAA Championships, we have decades of collective real-world expertise. We can relate to what a headache the day-to-day management of an event can be. That's why we developed LaunchTrack. With LaunchTrack, you don't just sell a ticket. You understand your customers better. You understand their interests. You see geography. You connect to their social networks. You use all this information to create custom audiences, so you make smarter decisions to produce and promote better events. We're looking for smart, motivated individuals - passionate about winning. Here at LaunchTrack, we're dedicated to changing the event business. To do this, we need the best talent. If you're someone that everyone else looks up to. If you're a self-driven, hardworking, "good is never good enough" kind of person, you should give us a call. Want to write a great story, win awards & acclaim? We're always here to help. Let us know how.